Musings from "Just One Man"
Who Doesn’t Love A Good Celebration!! Last night Miami Marlins hurler Chad Qualls had by far the best fist pumping celly I’ve seen for quite some time (the only thing that rivals this exuberant display is watching my former fantasy football co-owner @hooks41 celebrating his one and only long ball in Burlington Men’s slo-pitch action, which truth be told is worthy for a blog post on it’s own merit). Fist pump to front roll is no joke my friends. Tough work and he stuck the landing. That there is a veteran move my friends. Since I’ve been on a posting strike (self inflicted as previously noted) I didn’t really post my thoughts during the baseball hotstove last off season about the prospects of the Toronto Blue Jays returning to glory. If I was a revisionist historian I could easily play the “I told ya so” card and pretend that I didn’t think they would be any good in the AL east. Alas I’m not such a jerk (a jerk I am, but not this kind). The Blue Jays season hasn’t unfolded as it was scripted as of yet. Minus the 11 game winning streak, the Kawasaki phenomenon or the Steve “#RaisetheBar” Delabar all-star nomination the Jays season has a been a bust. A glass half full guy would suggest that half the season is still there for the taking, however a realist might tell you otherwise. Truth be told the Jays are a flawed a team. I still think that they have the makings of a team that can compete, but I think they collectively as a squad need to rededicate the way they play the game. My most pressing concern while watching the Jays play is how they approach their at bats. They have far too many swing and miss type of ball players. All or nothing can’t play in the AL East. That’s why somebody like Kawasaki is beloved by the fans/media because of the way he grinds out his at bats. For the Jays to a consistent threat game in game out they need to change their offensive style. But who am I, right? The title is a little misleading I know because as you might have guessed I am not actually Japanese. But you know who is? Munenori Kawasaki, the little ball of energy that has somehow electrified a mundane sporting venue known as the Rogers Centre (formerly the SKYDOME). Kawasaki had a RBI single in the fifth inning and a key at-bat in the ninth to help the Blue Jays edge the Baltimore Orioles 7-6 on Friday and stretch Toronto’s win streak to nine games. But it’s his seventh-inning homer that tied the game 6-6 that is memorable — even if it was a little hazy for him. 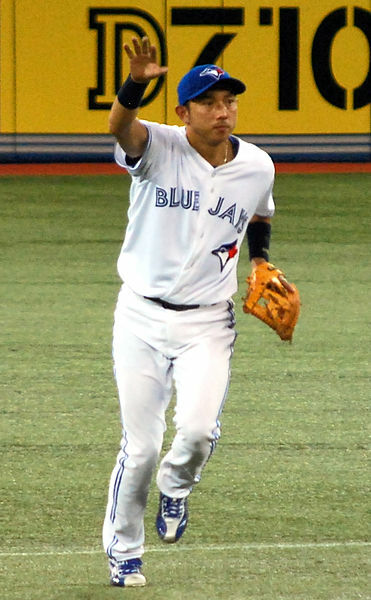 Kawasaki’s home run to shallow right field cashed in third baseman Maicer Izturis and brought the 35,472 Blue Jays fans in attendance to their feet. The raucous crowd demanded a curtain call from the Japanese infielder, chanting “KA-WA-SA-KI!” as he repeatedly bowed in gratitude. Even the First Lady can’t get enough of Kawasaki. Here’s hoping that Blue Jays G.M Alex Anthopavowels can find a way to keep him around when Jose Reyes is eligible to come back from his rehab stint. Maybe a surprise All-Star nod will help keep him around. If Kawasaki is sent down I hope he can lend me his little translation book so I can start giving my post Slo Pitch interviews in Japanese. I’d like to become the Kawasaki of the Burlington Men’s Slo-Pitch league.